President Donald Trump is blasting Harley-Davidson again for announcing it's shifting some operations overseas in the wake of retaliatory EU tariffs against U.S. duties. “Now that Harley-Davidson is moving part of its operation out of the U.S., my Administration is working with other Motor Cycle companies who want to move into the U.S. Harley customers are not happy with their move - sales are down 7% in 2017. The U.S. is where the Action is!,” Trump said on Twitter. Trump has repeatedly criticized the motorcycle manufacturer recently. Last Wednesday Trump said in a tweet, "Harley-Davidson should stay 100% in America, with the people that got you your success. I’ve done so much for you, and then this. Other companies are coming back where they belong! We won’t forget, and neither will your customers or your now very HAPPY competitors!" Harley-Davidson said on June 25 that tariffs implemented by the EU would increase the average cost per motorcycle by about $2,200 and the company will shift some production overseas as a result. The European Union imposed the tariffs in retaliation against the Trump administration's duties on steel and aluminum imports, which were an effort by Trump to protect U.S. jobs. No production will be moving to Europe as a result of the tariffs, according to the company. Harley's overseas manufacturing plants are in Brazil, India, Australia and Thailand. In the U.S., the company is shutting down a Kansas City, Missouri, factory and transferring operations to York, Pennsylvania. In 2014, the top five companies with the largest motorcycle market share in the U.S. were Harley-Davidson, Honda, Yamaha, Kawasaki and Polaris, according to UBS. Harley-Davidson's full-year 2017 motorcycle sales declined 7.2 percent from the previous year. The company's U.S. retail motorcycle unit shipments dropped 10.5 percent in the same time period. 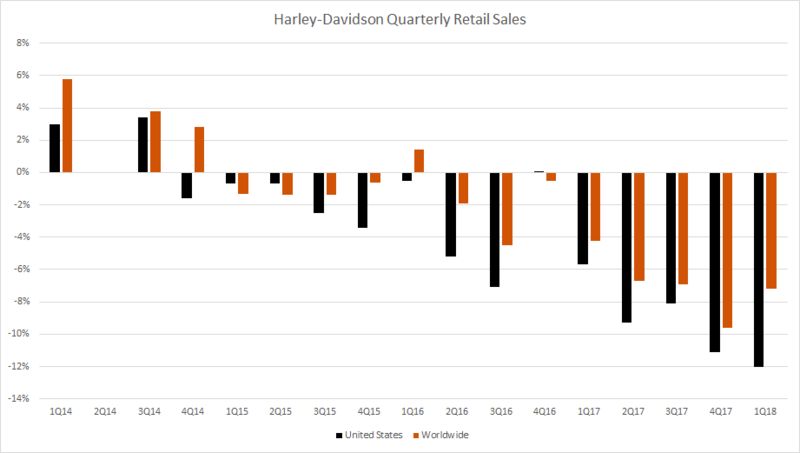 When asked for comment, a Harley-Davidson spokesperson said all Harley motorcycles sold in the U.S. are made in the U.S.
— CNBC's Evelyn Cheng and Thomas Franck contributed to this report.